Jetpacks, terraforming, and free to play, oh my! Since finally hitting open beta after years of development, the fine folks at Red 5 gave everyone a little sample of what to expect in Firefall. Their latest trailer is a high energy romp demonstrating the cell shaded beauty of the massive world they have built for the Sci-Fi MMO shooter. Firefall had been the top dog at trade shows for the past several years, with their booth that rivaled the size of a small town. After seeing the game for several years and dipping our toes in some closed betas, the game felt like it dropped off for a while to put some finishing touches on the development. The trailer gives a great look at how beautiful the world is, and some awesome modes of travel such as cycles, gliders, and of course jet-packs. 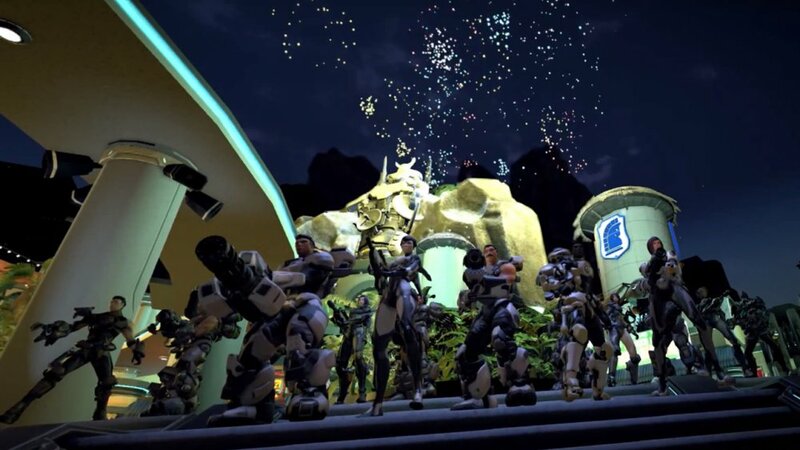 One of the main features of Firefall is the dynamic events that take place in different areas throughout the map. Hear a distress beacon and it is up to you (and your squad) to check it out, or ignore it and continue on your way. The trailer also gives us a taste of Red 5's take on the sport of the future, known as 'Jetball'. Sometimes soldiers just need a little R&R and Jetball looks like a cross between Grifball and Slamball, making for a great to pass the time when you're not battling the Chosen. Firefall is one of the only MMO's to use skill based combat (given that it is a shooter) meaning the better you are behind the cross hairs, the more stuff you are going to kill. If you don't know your way around a mouse and keyboard, don't fret! The classes (known as Battleframes) are balanced so that you can play a support role and build turrets or heal allies, making for a great co-op experience no matter what you're good at. You can enter the beta from the Firefall website. No official release date has been announced. Page created in 0.3426 seconds.